Hockey isn’t war and never was, despite the blood and the punching and all the borrowed bellicose terminology, the attacking and the shooting, the battling and the holding the fort. Hockey means no disrespect: it well understands, as we all do, that war is war and hockey is only ever hockey. Hockey admires wars, of course, which is to say soldiers: it has lots of time for honouring those in uniform, always has. Because? Well, hockey is nothing if not patriotic and understands, too, the sacrifices soldiers make, and those are worth constantly honouring, aren’t they, in as public a way in as meaningful a venue as we have in Canada? (Maybe the camo sweaters are a little much, and maybe too the light armoured vehicles patrolling the ACC ice.) There’s no denying that hockey and wars have — speaking very generally here — drawn traditionally from the same segment of the population. Young men who play hockey have often in our history gone to war, and once they’re soldiers there’s no stopping them from taking to whatever ice they can find behind the front lines. It reminds them of home; it’s also just something we Canadians do. Soccer sometimes causes a war (see Kapuscinski, Ryszard), but hockey has never been that careless. In at least one case, though, a hockey game played in wartime seems to have precipitated a real live battle, resulting in real dead casualties. I don’t have much on this; I’m doing my best trying to find more. The game was in Belgium, Brussels, in 1941, during the German occupation; Canadians had nothing to do with it, as far as I know. I got in touch with the Royal Belgian Ice Hockey Federation to ask what they might know, exchanged e-mails with the gracious and helpful Jan Casteels, but he’d never heard of this dreadful match-up, which took place on a Wednesday in December of 1941, the very last one — New Year’s Eve. I’d come an account across in an Australian newspaper, published several days after the fact. That’s where this started for me. It was a tiny newsbreak and secondhand, quoting a Swedish newspaper whose correspondent had picked up the news in Berlin. Details were meagre. Who was playing, on which ice, what started it, why: I don’t know any of that. I don’t even really know what it was. 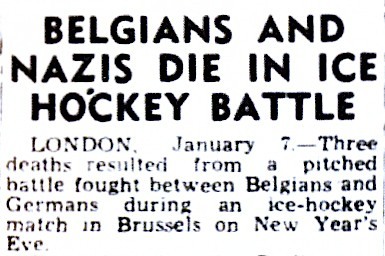 Belgians and Germans fought a pitched battle during an ice-hockey match: three people died in the rink. 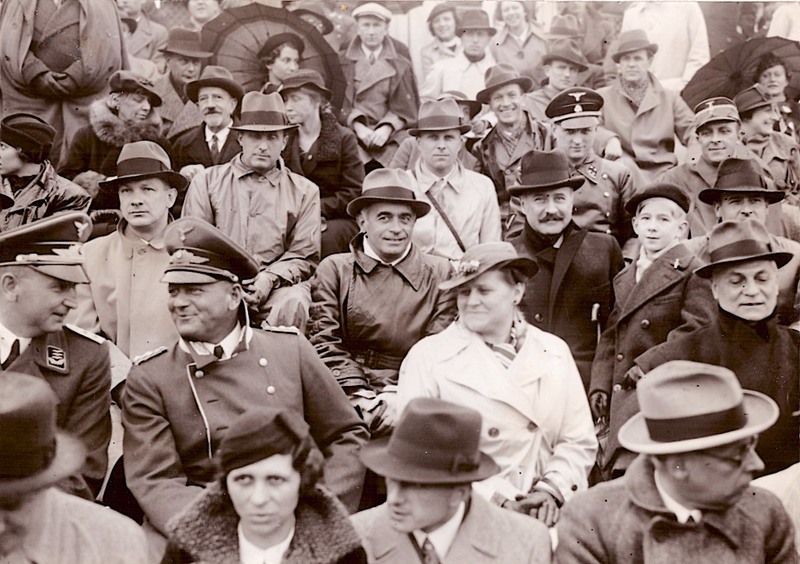 Spectators, I think, though I suppose they could have been players. The report lists the dead as a Gestapo man, a German soldier, and a Belgian. A second Belgian was wounded. By the time the news appeared in Australia, a German military court (the Swedish reporter said) had already sentenced three other Belgians to die. 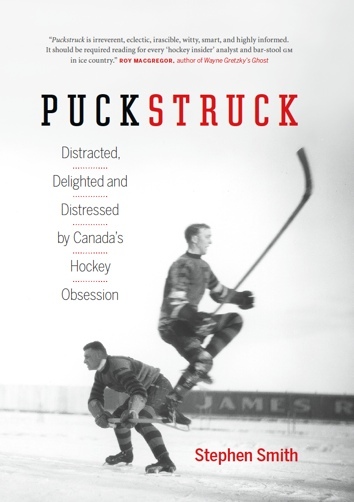 Anyone with any leads on the awful events in Brussels on December 31, 1941, please drop a line to puckstruck@gmail.com.